1 Came in for broken center pivot on plow, and right turn signal not working. 2 Center pivot about to break completely. 3 Hole in bottom of A Frame fixed. 4 Hole in Quadrant egged out BAD. 7 Stack of washers welded together to replace clip that broke off due to poor weld penetration by Western. 10 NEW control harness I made. Heat shrink on flag connectors with dielectric grease packed inside them. 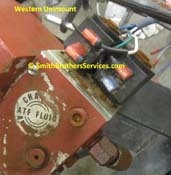 11 Plow light wires. Can you say overheated??? Piece of new wire for comparison. Ran all new wires from plug into each light. 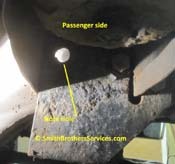 13 Once the plow was rewired, there was another problem on the truck side. Wire rotted out of quick splice connector. Had to replace socket too. The X is where they used a second quick splice connector because apparently he purple wire was not long enough! 14 Well it is in for MEYER Nite Saber II plow lights to be installed (2 months later). 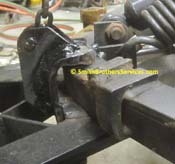 There is a bent clip that holds the Quadrant that needs to be straightened, and the whole plow is leaning forward. 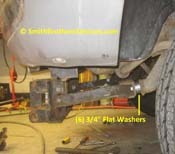 17 Plow frame pushed back. 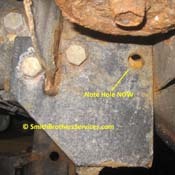 I put Note Hole on the pic, because I thought a bolt should have been used in that hole, you will see why not later. I do think 2 bolts there is not enough though... I did not do this install. 18 You can see the frame brace has moved back. 19 Hole on passenger side. Again, looks like a bolt should be there. 20 Headlight relays...next to the battery with contacts facing up! 21 One of the complaints is that I just re-wired everything on the plow side, and now the passenger side headlight stopped working. Maybe the missing wire feeds the right side headlight? Not sure, don't care, this crap is going in the garbage. 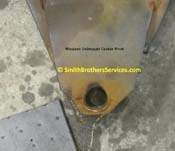 22 Anyone who followed my 1998 Dodge ground problem and repair will recognize this... Same ground problem waiting to happen here. 24 Well when I repaired the passenger side, I had to replace the socket due to rotted wires, and this side is no different. 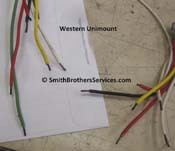 The scotchlocks (quick splice) connectors caused the wires to rot away. 25 Now, the frame has been pulled forward to where it belongs. Like it says, Note Hole NOW. 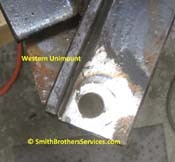 So with the plow frame vertical, the hole in the frame does NOT line up for a bolt to go through. Since it is actually a slot in the frame, I passed on reaming it for a bolt, as I feel it will not hold. 26 Since the rear kicker braces were pushed back, and I assume the holes in the truck frame egged, I decided not to loosen the bolts and pull it forward, since it is going to want to get pushed back again. I had some 3/.4" steel blocks I was going to use, but they were not thick enough to take up the gap. So I used a stack of 3/4' washers. 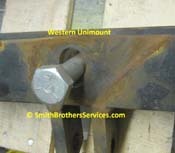 In the off season I will add more braces to this plow frame where they belong to stop this problem in the future. 27 Well this is MUCH better than when it came in. The customer LOVES the Meyer Nite Saber II lights. 28 Another view of the relays that were sitting with the terminals facing up next to the battery... It took 3 years for them to get this bad. 29 Oops. Back again, now the keeper broke off completely. 30 Weld 1 let go first, probably a long time ago. Weld 3 was piss poor to begin with. Weld 2 was only good in the one spot where it tore out the chunk of steel. 31 Smart driver. 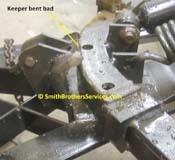 He was able to get the plow back here for repair by putting the chain on a trip spring. 32 Noseplate torn and twisting.